the Lord of heaven, our King. Undoubtedly, Jeannette Threlfall had Mark 11 in mind when she wrote this text, but she also alludes to Jesus' welcoming of the children in Mark 10:13-16. Stanzas 1 and 2 tell how the children shared in the songs during Christ's procession into Jerusalem. Stanza 3 is our cue to participate in praising our Redeemer. 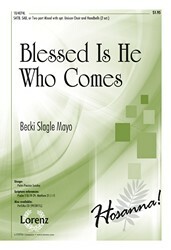 Like "All Glory, Laud, and Honor," this text is based on Christ's triumphal entry on Palm Sunday. However, "Hosanna, Loud Hosanna" focuses more on the children's role in that event. The text was written by Jeannette Threlfall in an "idle moment" (as she says she wrote all of her hymns, all others of which have been forgotten). Undoubtedly, Threlfall had Mark 11 in mind when she wrote this text, but she also alludes to Jesus' welcoming of the children in Mark 10:13-16. Stanzas 1 and 2 tell how the children shared in the songs during Christ's procession into Jerusalem. Stanza 3 is our cue to participate in praising our Redeemer. Published in a chapel hymnal for the Duke of Würtemberg (Gesangbuch der Herzogl, 1784), ELLACOMBE (the name of a village in Devonshire, England) was first set to the words "Ave Maria, klarer und lichter Morgenstern." 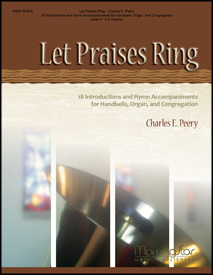 During the first half of the nine­teenth century various German hymnals altered the tune. Since ELLACOMBE's inclu­sion in the 1868 Appendix to Hymns Ancient and Modern, where it was set to John Daniell's children's hymn "Come, Sing with Holy Gladness," its use throughout the English-speaking world has spread. ELLACOMBE is a rounded bar form (AABA), rather cheerful in character, and easily sung in harmony. 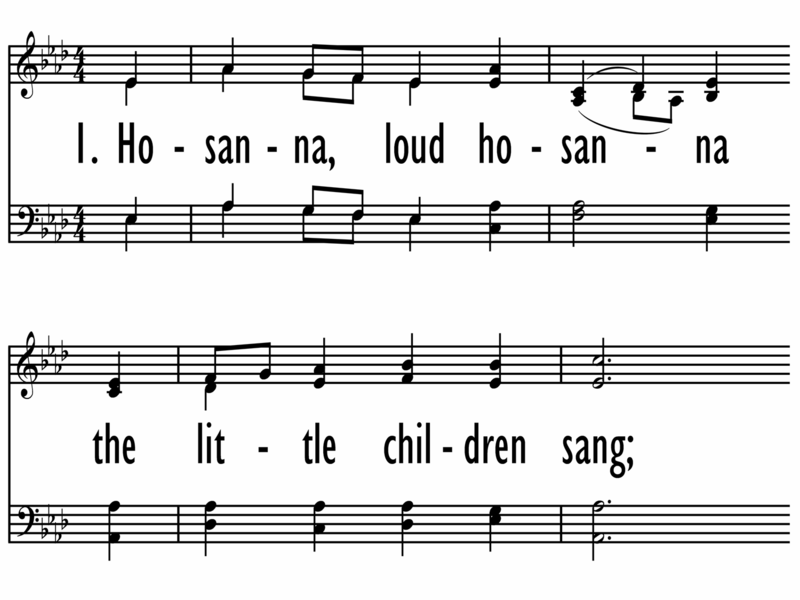 Try having a soloist sing the story in stanzas 1 and 2, with the children (or entire congregation) joining in on stanza 3. Jeannette Threlfall’s (b. Blackburn, Lancashire, England, 1821; d. Westminster, London, 1880) life was extremely difficult: she was orphaned at an early age, and two serious accidents caused her to be an invalid for life. But she bore her misfortune with grace and fortitude and maintained a ministry to many people who came in contact with her. Threlfall wrote devotional verse, which was published anonymously in various periodicals and later collected in Woodsorrel, or Leaves from a Retired Home (1856) and Sunshine and Shadow (1873), which included "Hosanna, Loud Hosanna." There was a video that went viral a few years ago of a four year old girl looking in the mirror and exclaiming about how much she loved everything in her life. I suspect it went viral because of its infectious positivity and the reminder that we could all use some child-like enthusiasm and gratitude. If we still need this message today, it means we have forgotten in part the beautiful story of Jesus welcoming the children unto him. Those children were able, more than the adults, to receive the Kingdom of Heaven like a gift, with unquestioning joy and gratitude. Jeannette Threlfall reminds us of that joy in her hymn, “Hosanna, Loud Hosanna.” She imagines those children running throughout the city, bursting with excitement and love for Jesus; a simple, undignified, giddy kind of love. As we raise our own “Hosannas,” we are called and invited to do so with the same exuberance and joy as these children who praised the One who first loved them.